without color band. Imprint front or back. with arch color band. Imprint front. with arch color band. Imprint back. with straight color band. Imprint front. with arch color band. Imprint front and back. with four color front, one color back. with arch color band. Imprint front or back. in vinyl pouch. Imprint front. 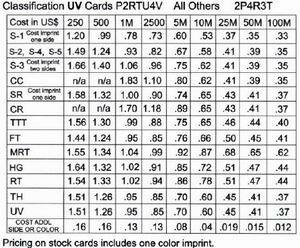 Pricing on stock cards includes one color imprint. Colors of Imprinting: Any standard colors, including any PMS match. Area of Imprinting: S-1 Front 3"X3/4"; Black 3"X5/8"; S-2, S-3, Front 3"X5/8"; S-5 Front 3"X3/4"; S-3, S-4 Black 3"X3/4 SR Front 2"X3/4"; Back 4"X½"
Theme Cards: Back Horizontal 3"X3/4", Vertical 1 7/8"X1½"; TTT Back 1 7/8"X1 1/8"; FT Front 3"X7/8"; MRT Front 3¼"X1¼"; HG Front 1 7/8"X½"; RT Front 1 7/8"X5/8"; UV Front 2"X7/8"; or Back 3"X1 7/8"; TH Front 5/8"X1½". Custom Cards and Rulers: entire surface. Set Up Charges: $33.00 (X) per color per side. Repeat orders ½ setup charge. No charge for straight line typesetting. Artwork Charges: SPC can provide complex logo artwork - charges will vary. To order cards, please call us at 1-310-897-5055 or email us at Sales@SPCcenter.com with the card name(s), how many you want of each, and the shipping charges. If you have a PayPal account, you may use PayPal's service with our account name, StressCard@AOL.com, as the payee. SPORTS CARDS (improve sports ability). The FOREHEAD THERMOMETER; and The HAPPY CLOWN CARD (ideal for teaching children to relax). REFRIGERATOR & FREEZER THERMOMETERS; and HOT WATER gauges. The MASSAGE CARD (all great at parties). NEW YORK CITY POLICE DEPARTMENT – initiated 500 stress cards into its stress management workshops for upper level police management. Police Officer Philip Gager says he hopes to get all New York Police using these cards. FAA FLIGHT SAFETY INTERNATIONAL (Ft. Worth, Tx) – Largest pilot training program in U.S. thaat trains more than 25,000 pilots and mechanics a year. Cards used within stress management portion of “Practical Cockpit Management” course in Ft. Worth. Instructor John Nasch has been working to incorporate the card into similar programs for the 26 other FAA Flight safety programs throughout the country. BOEING CO. Seattle, WA WEIGHT CONTROL GROUP – Approximately 160 employees intent on slimming down use Dr. Barrios’ stress control cards as anti-stress/anti-crave devices. US AIR FORCE – 37,000 cards being used for stress management and a Family Advocacy Program. U.S. ARMY (Ft. McPherson, GA) – recently placed an order for 5,000 cards for its Alcohol and Drug Prevention Control program. Letterman Medical Center (San Francisco) also using stress cards. DEPARTMENT OF CONSUMER AND REGULATORY AFFAIRS (Washington, D.C.) – Cards used in launching of a “wellness” program for employees. “Every manager here tested black or red (signals stress state) on the card the first time – the card forced them to be aware of their stress and then showed how to reduce it.” Michelle Chargois, DCRA. CANCER SUPPORT AND EDUCATION CENTER (Menlo Park, CA) – More than 500 patients and families have used the stress management sessions as part of the center’s cancer counseling program. BREATH OF LIFE STOP SMOKING CENTER (Everett, WA) – Clients are using the cards to kick the habit and it’s working! ARIZONA PUBLIC SERVICE CO. (Phoenix, AZ) – Ordered 10,000 cards for employee stress reduction; integrated into stress management classes. “We’ve received positive feedback from employees... They’ve even asked for more cards.” Joan Ticknor, Analyst, Employee Services Dept. ECKER CENTER FOR MENTAL HEALTH (Elgin. IL) – “The cards are quick, accurate and an easy to use method for monitoring patterns of stress throughout the day... We’ve sold a total of 32,857 cards (as distributor) to 73 mental health agencies, hospitals and private practitioners.” Kathy Woodman, Public Relations Consultant. FAMILY DENTAL PRACTICE (Mt. Clemens, MI) – Thomas N. Vaughn, D.D.S. conducted a study to determine if use of stress card/booklet relaxation techniques would control child dental patient’s anxiety. Dr. Vaughn reported observers rated the children as “more cooperative during treatment, exhibiting fewer disruptive behaviors.” He added the children easily learned and liked “The Clenched Fist” and “Deep Breath” relaxation exercises. JACKSON COUNSELING CENTER AND PSYCHIATRIC HOSPITAL (Jackson, TN) – 5,000 cards used in patient stress management counseling and as outreach tool for community. “The cards have helped to lessen people’s fear of seeking psychiatric help – or in simply calling us to ask questions”, says Counselor Andy Eichoff, Jr.
WASHINGTON IRVING HIGH SCHOOL (New York) – ordered 10,000 cards for its drug control program. DR. MEYER FRIEDMAN, CO-AUTHOR OF “TYPE A BEHAVIOR AND YOUR HEART”, considered the #1 authority in the field of heart disease and stress, has recommended the Stress Control Biofeedback Card to his patients. THE AMERICAN HEART ASSOCIATION – ordered 25,000 cards recently. THE AMERICAN CANCER ASSOCIATION – ordered 20,000 cards for The Great American Smokeout Campaign in 1997.